Now he sees the merits of BAC and a healthy lifestyle. As many of you know, how much I was amazed by my early personal results using the Bio-Algae Concentrates, and also intellectually impressed by what had been achieved and proven a long time ago (1970 to 1995) in a country far away (Russia). But now, 18 years later, having witnessed and gathered so many wonderful results obtained not only by myself, but also by my family, my pets, our friends and clients, their family, friends, clients and their animals, I cannot find a word to express this “amazement”. Every day I receive emails, phone calls where someone share their story. Just yesterday, Victoria called to tell me how after 40 years, she was finally having normal bowel function. She was crying with deliverance and joy. Last week I attended the American Holistic Veterinarian Medical Association (AHVMA) annual conference in Augusta, GA. and there had the opportunity to revisit with many of our clients that are carrying the BIOPREPARATION formulas in their animal practice, and the many that are also using the BIOSUPERFOOD for themselves and their family. We also met many new veterinarians that after hearing of Dr. Kiriac’s story and research decided to carry the product in their practice. Exhilarated and fresh from this veterinarian conference, and aware of the many previous and new readers that are passionate about human and animal health, I want to update you on the extraordinary story of Merri’s bighorn sheep, a story that I have been following closely now for seven years, that I had initially shared with you in 2008 as “Saving Merri’s Bighorn Sheep“. 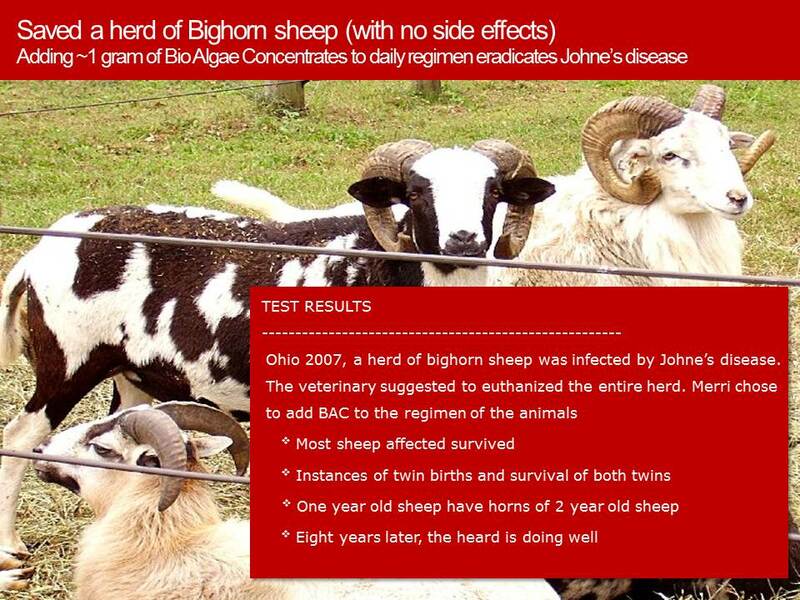 It is now seven years that the bighorn sheep have been saved from Jhone’s disease, an infectious disease that would have killed the herd had it not been for introducing BAC in their diet. 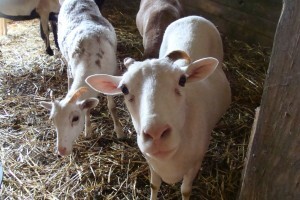 Last year I visited Merri at her farm and got to meet the sheep, the boys and girls, and their young ones. What majestic animals. I hope you will be thrilled as I am in following the story. The boys do not care much for visitors. They are more likely to be protective for the females. 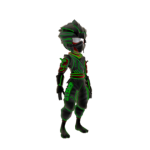 The lady are beautiful and ready to be friendly, to be touched. They like to look in my eyes. 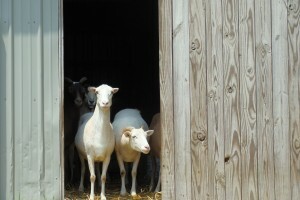 The ladies came out right away and appeared quite curious as if they wanted to come and meet. The young’s preferred to hang together and chose to stay at a great distance. The Bighorn Sheep are Alive and Kicking! Starting in the early 70s, agencies in the former USSR invested more than 20,000 person-years of research and development to produce Bio-Algae Concentrates (BAC) that held extraordinary nutritional properties. The results of this development work has since come to Canada and the US and, in this particular study the BIOPREPARATION formulas were evaluated in regards to their ability to support the healing of bighorn sheep in a herd affected by Johne’s disease (pronounced yonee’s). 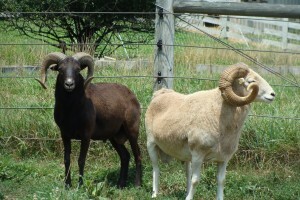 The research group consisted of Merri Mason, owner of Bighorn Sheep Farm, in Butler, Ohio; Michael Kiriac, PhD with BioSuperaliment Inc, Laval, Quebec; and Roland Thomas, NMD with BIOAGE Inc, Niagara Falls, NY. Johne’s is a disease of ruminants characterized by wasting and, terminally, by diarrhea. It is caused by the bacterium Mycobacterium avium, subspecies paratuberculosis. Johne’s disease has been reported all around the world in cattle for several decades. Although it has also been reported in sheep for many years, no one is certain of how widespread it is or exactly how much damage it is doing to our sheep industry. Usually this disease will kill most animals of the herd by the time they reach 2 years of age. The blend of BAC under evaluation, developed by Michael Kiriac, was composed of four microalgae, specifically selected to yield nutritional completeness, balance and synergies: Spirulina Pacifica, Spirulina Platensis, Dunaliella Salina and Haematoccocus Pluvialis, which are all maintained whole, pure and free of pesticides or herbicides. The ingredients in BAC are rich with thousands of naturally occurring nutrients such as: vitamins A, B complex, C, E, complex dietary carbohydrates, essential fatty acids (EFA), minerals and trace elements, complete proteins, and more than 4,000 types of active enzymes. BAC is also an exceptional source of beta and alpha carotene, chlorophylls, phycocyanin and astaxanthin. BAC contains as much as 60% of complete proteins (including all essential amino acids) of which it is estimated 98% are assimilated. Each alga in BAC is pushed to nutritional peaks via innovative hydroponic technologies applied during their growth. When blended together, the algae in BAC reach very high bioavailability because of the balance and synergy obtained. BAC was developed for the needs of animals. The results obtained in previous animal studies show that the BAC micro algae combination nutritionally improves homeostasis in the endocrine system in animals, and the natural balance of all metabolic functions shifts towards overall wellness. 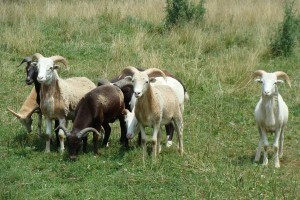 For the purpose of the study some selected sheep were kept apart from the main herd. At the start of evaluation, the herd was already being decimated by Johne’s and the owner was thinking to euthanize the entire herd as recommended by the local veterinarian (often, once a herd is affected, there is no other solution). BAC was incorporated into the animal regimen fed daily to the selected sheep, with the purpose of increasing overall cellular nutrition resulting in increased vitality and immunity. The reports were compiled after 6 months and 11 months. The ultimate intent of this study was to save Merri’s sheep, including as many as possible of those already infected before the study began, and certainly their offspring. Many other benefits were observed with the sheep, much the same as those demonstrated with several species during the Russian research. Benefits such as: calmer mood, shinier hair and coats, larger healthier animal, less feed needed, increased survival rate, prevention of mad cow disease, prevention of various viral or bacterial infections, healthier animal from one generation to the next, prevention of osteoporosis and increase in bone mass, increased fertility, increased protein and good fats in milk, eggs and meat and many more benefits were reported.